Chair with black or mocha embossed metal base. Available with body in natural or stained eucalyptus, with or without cushion. Also available in the completely covered version, leather or Kvadrat fabric. Sila chair & Sila cone shaped Chair with shell of natural or dyed eucalyptus wood, or covered in leather or wool. Legs in lacquered metal. Over 100 chairs in one chair. Change shapes and functions with numerous interchangeable variants, while maintaining the attractiveness of natural materials. For the body: all wooden or partially or fully upholstered in the interchange between leather and wool. And for the legs: four in black or mocha embossed metal, stackable or trestle. 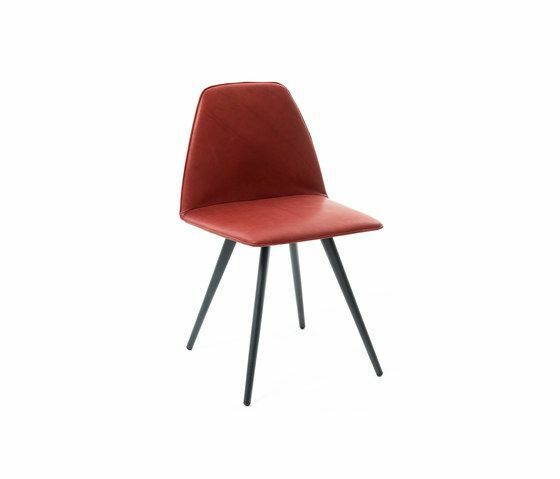 Sila chair trestle Chair with shell of natural or dyed eucalyptus wood, or covered in leather or wool. Legs in lacquered metal. Over 100 chairs in one chair. Change shapes and functions with numerous interchangeable variants, while maintaining the attractiveness of natural materials. For the body: all wooden or partially or fully upholstered in the interchange between leather and wool. And for the legs: four in black or mocha embossed metal, stackable or trestle. Discipline is a new Italian design brand. The name Discipline, which means order and competence, combines the method and the message at the origin: creating a new generation of furniture and accessories to lend emotion to the real life.